Rooted in empowerment and gratitude, abunDANCE with Keo® is a high energy dance class committed to using movement and joy to celebrate and empower you. Using various dance movements such as Hip-hop, Afro fusion, twerk, and other art forms to promote creativity, liberation and abundance. Creating spaces for authenticity, outrageousness and joy! Be prepared for abundance and sweat. San Diego native, and Brooklyn transplant, Keomi Tarver is a dancer, writer, lover, teacher and friend. She began training at the age of 12, and is skilled in Modern, West African, Hip Hop, and Interpretive Dance. Throughout the last decade, Keomi has showcased her work on various stages and respected institutions including San Diego State University, Yale University, the Brooklyn Museum of Art and SummerStage. In 2010, while performing in “Hip Hop Saved My Life,” a celebration of Hip Hop through spoken word, dance, music and art, Keomi was inspired to continue the journey of combining spoken word and dance. In 2014, Keomi wrote, choreographed, and directed “Love & War.” Infused with dance and poetry, “Love & War” welcomed the vulnerability and work that love and war can bring to the surface, leaving us exposed and, eventually, free. Also in 2014, Keomidirected, produced, and starred in “Superpower,” a powerful video showing the power of choice. Inspiring our communities to be loving, courageous, and free. Keomi is the Director and Choreographer of abunDANCE with Keo, where she uses movement, facilitation, workshops, and love to encourage her community to create, live, and love abundantly. She is known for her strong and unapologetic movements, her transparency, and her smile. Her purpose is to use her gift to remind others how valuable and beautiful they are. You can findKeomi teaching her students the elements of Hip Hop throughout the 5 boroughs of NYC, creating affirmations with her friends, and hugging her mother. Enjoy learning ballet while developing confidence, mental concentration, physical coordination and grace. This class is for students who are new to ballet, students who want to dance, but never had the opportunity, and those who have danced before and want to begin again. A Principal Dancer with the Charles Moore Dance Theatre for more than twenty-five years, Ms. Lonnie also served as an Instructor for the Charles Moore Dance Center for Ethnic Studies and was the Artistic Director/Choreographer for the Charles Moore Youth Ensemble for over nineteen years. Belly Dancehall is a fluid mix of North African Belly dance and Afro- Caribbean movement. It ignites rhythm and flexibility, improves posture and grace. Unique choreography that awakens joy and overall well being. Tones the abdominal region, firms thighs and glorious gluteus muscles. Maya Louisa was born and raised in Brooklyn, New York. Maya began dancing at the age of three. Eventually training at the Alvin Ailey Junior Division School, she spent High School choreographing and performing to the music of her favorite artist, Aaliyah. Maya holds a degree in Cultural Anthropology and a minor in Dance from Howard University. While at Howard she joined Afro-Cuban dance company, Alafia and toured internationally including Europe, South America, and the Caribbean. She also spent a summer residency with Ballet Hispanico under the direction of Tina Ramirez. Maya holds a certificate of professional development and study from the Board of Education Dance institute based on the Katherine Dunham model. She frequently travels to Cuba to deepen her knowledge of Afro-Cuban dance studying with both Ballet Folklorico Cutumba of Santiago de Cuba, and Cojunto Folklorico Nacional of Havana, Cuba. Maya currently performs and choreographs in both New York City and Los Angeles. Dancehall..it's time to buss di dance and free up yaself in this raw energy, action packed dance class. Feels more like a party as the session organically moves through authentic Jamaican Dancehall steps, technique of the movement, songs, & history. Vibez. Feeling, and Flow is the key to learning this style. ..open to all! Buss a whine, buss a dance, buss a sweat! This 45 min class is a full body dance workout to a high energy mix of Soca, Afrobeats, Dancehall, & Latin sounds. Using Afro Caribbean music and movement, Fiyah Burn is designed for women to get fit, have fun, celebrate culture, and embrace the goddess within. Jessica Phoenix is the owner of FIYAH Productions, LLC which produces FIYAH! Dancehall Theater, a full theatrical performance featuring energetic Dancehall music, vibrant choreography, and moving storytelling! It premiered November 2013 at Roulette Theater in Brooklyn and received great reviews spawning a 2nd season that was staged in 2014. A third season is in the works with plans to begin touring in 2016. As a blossoming choreographer, Jessica's first major work was for an MTV Networks National commercial featuring International Artist K'Naan. Jessica has toured nationally with Universoul Circus U.S. Tour 2009 & 2010 as well as King Michael International and National Tour, a live Michael Jackson tribute show traveling to Canada, New York, & the West Coast. After a few years of touring, Jessica landed a principle role in the first full production of iLuminate Dance (America’s Got Talent Finalist) at Six Flags Over Georgia. Jessica was introduced to dance at a very early age via Ballet, Tap, Jazz, and Hip Hop at PizazzStudio and Joyce LaVerne Dance School in Maryland. In high school, she joined the EleanorRoosevelt High Dance Company led by Maya Yamada. While studying at Howard University shebecame a member of Urban Moves, later called X-Faction, a professional hip hop dance company studying under Derek Brown and Cheryl Brown, the Directors who named her Phoenix. Jessica's dance life and college education was abruptly stopped by a severe car accident in 2007. After a two year recovery period, this experience raised her level of intensity, passion, anddedication to creating a life of joy. The name Phoenix meant more than ever. Jessica graduatedfrom Howard with a B.A. in Audio Production and moved to Atlanta to pursue her dance career.Atlanta became the seed for the early stages of FIYAH working with Cici Kelley, Quincy Lamar,Rikki McKinney at Gotta Dance Atlanta. Frequenting clubs, dance competitions, and performingwith artists like Verse Simmonds, her love for Dancehall grew. Jessica was the first to bring apopular weekly authentic Dancehall class to Gotta Dance Atlanta and caught attention of Kingston, Jamaica’s DanceJA owner, Latonya Style. Jessica soon formed Fiyah Squad in Atlanta, an all female performance group that helped to bring authentic Dancehall to the mainstream dance scene. Jessica remains close to Dancehall’s home in Jamaica by making annual trips to the island forcontinued inspiration. While in JA, she studies and connects with veteran and young Jamaicandancers. In 2013, Jessica was the only American guest instructor teaching at the InternationalDancehall Homecoming Event and competed, landing 3rd place in the first-ever InternationalDancehall Championships held in Kingston, Jamaica. Now living in NYC, Phoenix is currently a Dancehall and Dance Fitness Instructor at BroadwayDance Center, Breakin Boundaries, and Gymstars in Brooklyn. Jessica is still an active company member with iLuminate, highlighting her recent performances in Mexico City, Obama’sPresidential Inauguration, and Magic TV in Paris. Jessica is very excited and thankful for theopportunity to join Latonya Styles’ Dance JA teaching roster and has partnerd with new FIYAH!Brand Manager, Lady Sol Inc. Both entities will help bring FIYAH! worldwide for 2015 and beyond. 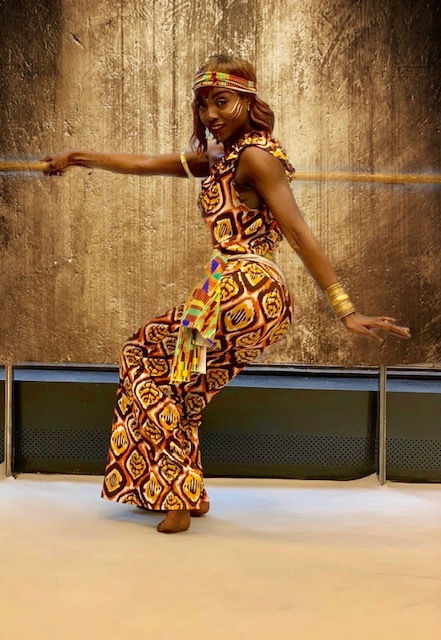 This energetic class takes you on a journey across Africa on the dance floors. Let Nado introduce you to the most popular Afro club music hits and dances from the Ivory Coast, Congo, Ghana, Nigeria, South Africa and Angola. Come experience this lively blend of beats alongside traditional and contemporary movement. Nado is from Côte d’ivoire. She has danced and choreographed shows and videos for many West African Artists such as Awilo, Logomba, Wizkid, Eddy Kenzo, Flavour, AfroB Sam Klef, Barbara Kanam, Sakis, Sekouba Bambino, and Orius Mabele. In this class, Nado introduces various choreography and all the latest dance steps from all the African hit club music from Côte d’ivoire, Ghana, Nigeria, Congo, and Angola, coupè dècale. Nado also incorporates dance moves from: Soukouss, Ndombolo, makossa, and all the new afrobeat steps. Haiti, the second independent republic in the Americas, partakes of three cultural sources: African, American, and European. The dances and culture of Haiti have been extremely important in the development of American dance, thanks to the pioneering work of Katherine Dunham. Peniel Guerrier draws on his extensive knowledge of Haitian folkloric dance to create original combinations within the different traditional Haitian rhythms. His dances enhance the energy and flow of traditional forms with beautiful, vivid body shapes. Peniel Guerrier has been studying Haitian folkloric dance and music for the past 25 years. He began instruction under one of the most prestigious Haitian folkloric dance teachers, Herve Maxi. He has subsequently performed with the National Dance Theatre of Haiti and Baccoulou Dance Company for eight years, touring worldwide to places such as Venezuela, Paris, Hungary, Japan, Montreal, Germany, and Santo Domingo. While living in Haiti, in addition to performing, Peniel taught at the National Dance Theatre and ENARTS, two of the foremost dance and music centers in Port au Prince. Peniel moved to New York City in pursuit of his dream of promoting and preserving Haitian folkloric culture. He draws on his extensive knowledge of Haitian folkloric dance and music to engage a diverse range of communities in learning about Haitian folkloric culture. As a dance teacher he is appreciated for his attention to detail, and unwavering confidence in every student. As a performer, he is famous for the energy and originality he injects into traditional dance forms, bringing audiences to their feet at every performance. Peniel teaches regularly at the Djoniba Dance and Drum Center (Peridance), and PMT dance studio. He has been a guest teacher at Smith College, Mt. Holyoke College, Greenfield Community College, Amherst College, Wellesley College, and Brown University. He travels regularly throughout the country to give workshops and lectures on Haitian folkloric dance and culture, at venues such as the New Orleans Dance Festival. Peniel and his students also perform throughout the year at venues such as the Alvin Ailey Dance Center and the Brooklyn Museum. Peniel is extremely interested in reaching marginalized communities through Haitian dance, and as such has held successful workshops with people with disabilities, older populations, incarcerated peoples, etc. Peniel has been featured in a variety of media, most recently WPIX 11, the Bomb magazine, New York Seikatsu, Daily News, NYU Washington Square News, Haiti Exchange Newsletter, Variation News (CT) and Alter Press Lincoln Center. Come ready to dance! Cassandra Nuamah brings the fire each week in this high energy cardio dance class. She chooses a style from the popular monthly workshops she teaches at the studio, so you never know what you're in for. It could be Kukuwa, House & Funk, or Soca & Dancehall. You'll have to come to find out! Either way it's tons of fun & highly effective. Come check it out! NEW A beginner friendly class for those who are new to the world of dance. This class is designed to make people feel comfortable in their body, overcome feelings of insecurities when dancing, learning basic dance steps that you can take to any social gathering, and most importantly; having fun! Born in Rock Hill, South Carolina, Laci Chisholm has been dancing nearly as long as she has been walking. A gifted and outgoing child, Laci’s desire to express herself has driven her passion for dance and given her a remarkable creative outlet. Laci studied dance intensely throughout her adolescence perfecting her craft and developing her ability to share the skill of dance with others. With a strong performance background Laci has studied several genres of dance including African, Jazz, Haitian, Hip-Hop, and Tap. While attaining her undergraduate degree at the University of North Carolina at Chapel Hill Laci never lost her zeal for dancing. She was the principal dancer of Opeyo, her college’s Hip-Hop dance team. In addition to performing with her collegiate dance troupe, Laci took a serious interest in sharing her love of dance with others. She nobly founded an after school hip-hop dance class for students due to a lack of resources in the community. Having had such success in building relationships with children through dance Laci assumed several positions after graduating where she was responsible for choreographing and teaching both competition routines and recital pieces respectively for Cheer America and the Academy for Performing Arts in North Carolina. Laci moved to New York City in the summer of 2006. She studied with the Hip Hop Dance Conservatory for a year and has performed at the legendary Apollo Theater and on the Rachael Ray Show. Though she loves to perform, Laci found her calling in education, receiving her Masters of Science in Education from Hunter College and has spent most of her career in that field, though dance was never far from her heart. She started Fit4Dance in 2014, with the intent of providing fun, challenging, and effective dance fitness classes to beautiful women across New York City. It has been her lifelong dream to operate a dance studio offering a variety of dance + fitness formats that have helped her maintain a healthy, fit, body. Laci is a certified Zumba instructor, a graduate of the Shape-Up NYC Instructor Training Program, a certified group fitness instructor through the Aerobics and Fitness Association of America (AFAA) and American Council on Exercise (ACE). Laci truly believes that dance has the ability to elevate the spirit, focus the mind, and center the body. This belief is evident in her high energy classes where her infectious smile and encouraging words will almost make you forget you're even exercising!